Sorry I missed a chance to meet a fellow Bus-Talker last Saturday. I was set to go up on Saturday for Members Day, but my back went out on me the previous Tuesday and by Friday, it was apparent that it wasn't going to measurable improve without going to a chiropractor so I had to pull the plug. The other bus you photographed is a TDH-5105, serial number 1491 delivered to ConnCo in August of 1955 and given fleet number 1491. 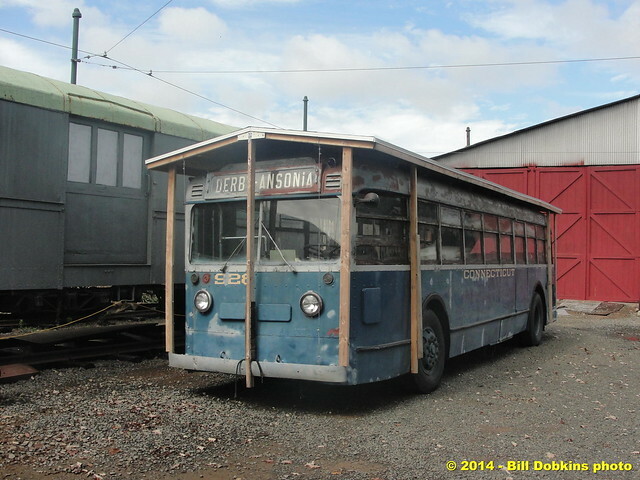 The bus you could see which is hopefully under wraps is also a TDH4-4512 serial number 2785 delivered to ConnCo in May 1958 and was given fleet number 1257. At one time the museum also had a ConnCo fishbowl # 2021 a TDH-4517 serial number 1720 delivered new in September 1962.. It was left to decay to point that vegetation was growing up through the floor. It was given to Double A transport in exchange for a tow truck. What happened to the bus is unknown since Double A is no longer in business. Connecticut # 1491 exemplifies the steel work that replaced the original aluminum sheet metal (done in production) on parts of the roofs and window supports to prevent hair line stress cracks that were plaguing New York City's 4510's. Connecticut did receive fifty of these 5105's numbered from 1450 and 1499 between 1954 and 1955. This may be the other bus that you spotted at Branford. 928 is a 1939 Yellow Coach, Model 731, serial number 440. The temporary roof was installed to protect the vehicle roof from further deterioration which occurred when the bus was in the possession of the Smithsonian Institution. I believe that I met you when you were signing up to operate at Branford that day (I was one of the people taking names), but I didn't realize who you were. I hope that you had an enjoyable time there in spite of the weather.